Owings Mills Volunteer Fire Company was invited to Franklin High School MC JROTC to show fire suppression equipment and firefighting skills. The class was held yesterday, Friday the 15th. Two former JROTC cadets who were alumni from Franklin High School, now members of Owings Mills Volunteer Fire Company, led the skill training session. Page Seville of T. Rowe Price’s office of Corporate Social Responsibility visited us at our meeting on January 28, 2019 with a generous donation on behalf of the T. Rowe Price Group, Inc.
T. Rowe Price’s office of Corporate Social Responsibility arranged for a contribution to all of the volunteer fire companies in Baltimore County. We were happy to welcome Page to our meeting to present, as she has direct connections to Owings Mills Volunteer Fire Company, with her father and grandfather having both been members. T. Rowe Price is the largest employer in the Baltimore County and wanted to give back to those who volunteer their time in the county. Thank you to T. Rowe Price and Page Seville for supporting Owings Mills and the Baltimore County fire service. Its December, and you know what that means? Our plan this year is to stop at common areas where large groups of people can gather to see Santa. We cannot make it to every street, this way we can give everybody an equal opportunity to see Santa by having our community come to him. It's important to note that Santa cannot get down from the fire engine. His large belly makes it tough to get up and down. If needed, one of our firefighters can pass a message to him. Let us know your there, flashlights and flashing porch lights helps. There are some streets that we just can't get down easily. If your neighborhood is listed for that night and you hear sirens, try to get out to a larger road to see Santa. Especially for dead-end streets and tight courts. If you have a special need for Santa to visit your home, please send us a private message and we will TRY to accommodate requests. Santa is pretty busy this time of year. We ask for a donation of your choice to the fire company to do this. Sometimes we have to take Santa on emergency calls with us. If we can, we will get right back out after the call. If not, stay posted to Facebook for updates on makeup dates. Don't forget that tree sales are still going on at the fire station. Stop down if you need a tree. Santa Claus will begin his visits around 6:00PM and he will finish around 8:30PM. The streets listed are meant to give the general neighborhoods, and not be a full list. If we were on your street before, there is a good chance you'll see Santa again. 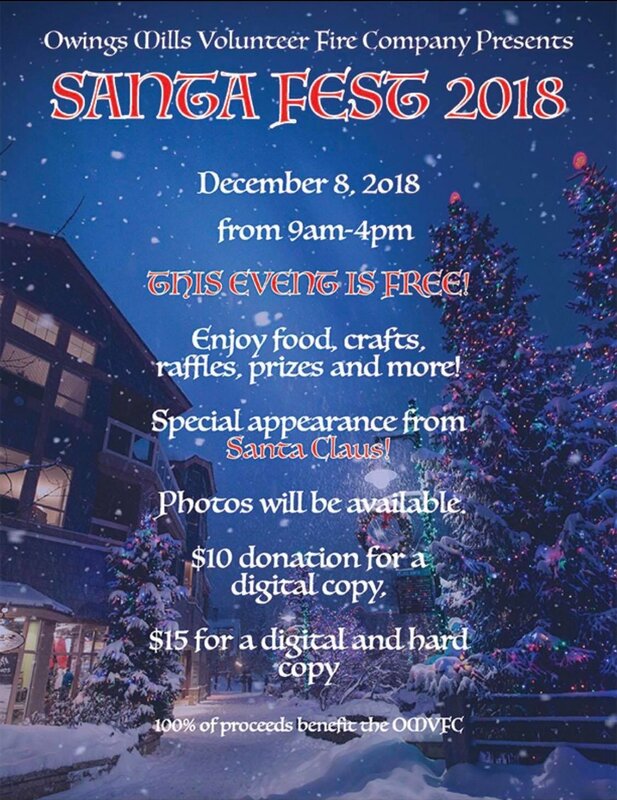 Come welcome Santa to Owings Mills at Santa Fest, on December 8th from 9am-4pm. Enjoy food, crafts, raffles, prizes, and more! And of course, a special appearance from Santa Claus! $10 donation for a digital copy. $15 donation for a digital and hard copy. 100% of proceeds benefit the OMVFCo. The volunteers of the OMVFCo will be starting Christmas Tree Sales this weekend. More information can be found on our Events Page. The Owings Mills Volunteer Fire Company is selling Christmas Trees once again this holiday season. Trees range from $40 and up. Douglas and Frazier firs are both available. Trees will be sold from 10 AM to 9 PM daily with free delivery available. Please help support your local volunteer fire company by buying a tree from OMVFCo this year! Visit www.omfire.org or call 410-363-1933 for more information. 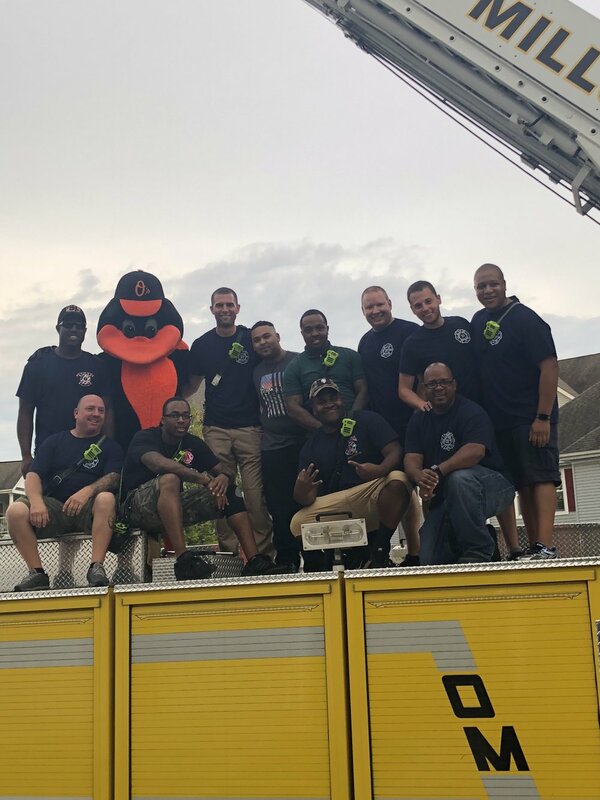 Owings Mills Volunteer Fire Company members and their families had a great day today at the station with crabs, burgers, hotdogs, and more! Our members responded to three emergency calls during the crab feast. A big thank you goes out to all of our members who made this possible! 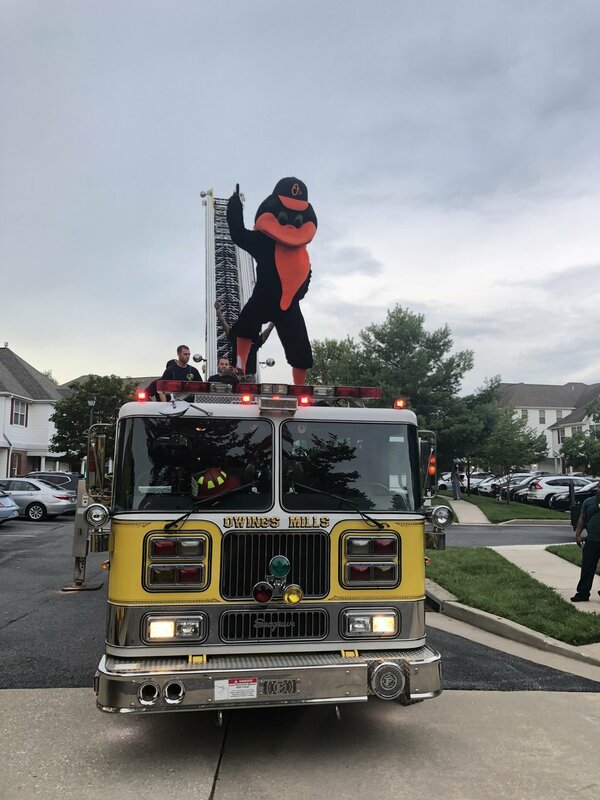 Owings Mills Volunteer Fire Company attended the 2018 Reisterstown Festival Parade on Saturday, September 8th, with Engine 312 and Truck 313. The parade began at 9:00am on Main Street in Reisterstown. Lt. Gov. Boyd Rutherford along with many antique and sports cars were in attendance. OMVFCo was joined by volunteer fire companies from Glyndon, Reisterstown, and Upperco. Due to expected heavy rain & possible flooding, the remaining Reisterstown Festival activities were cancelled for today, Sunday, the 9th. 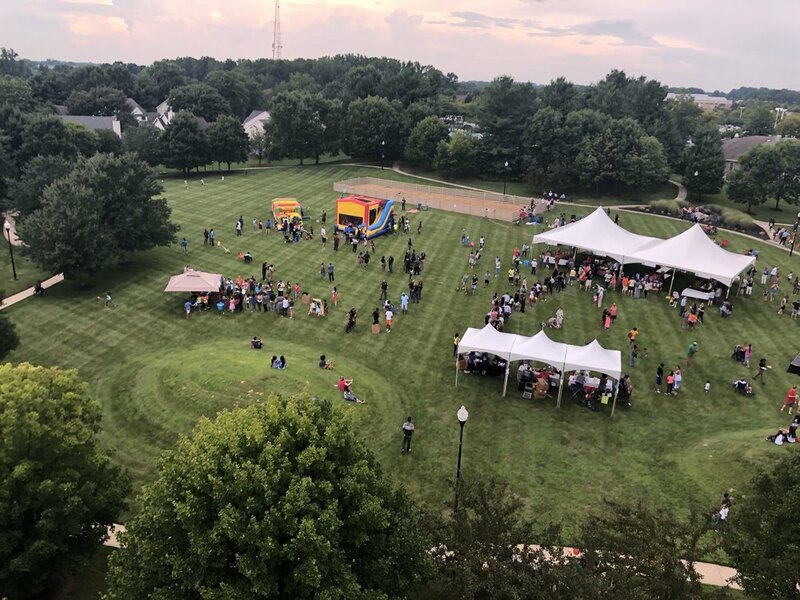 The National Night Out - 2018 in Owings Mills was a huge success. Volunteers from OMVFCo attended the annual community building campaign that promotes making neighborhoods safer and a more caring place to live. Dozens of businesses and organizations from around Owings Mills attended the event in Central Park in New Town. Santa clause will begin his visits around 6:00PM and he will finish around 8:30PM.